INDIAN OCEAN - Taking advantage of a growing naval partnership with Sri Lanka, the aircraft carrier USS John C. Stennis (CVN 74) established a logistics hub in Sri Lanka to receive support, supplies and services at sea. A C-2 Greyhound carrier onboard delivery aircraft accessed the hub’s strategic location before bringing supplies to John C. Stennis. Established on a temporary basis in the island nation, the hub provides logistics support to U.S. Navy ships operating in the Indian Ocean. The temporary air logistics hub concept allows for the use of an airstrip and storage facilities to receive large-scale shipments to move out in various directions in smaller shipments, allowing ships to continue operating at sea by receiving the right material at the right place and time. The hub can also be established to provide expeditionary logistics support during humanitarian and disaster relief missions (HADR). 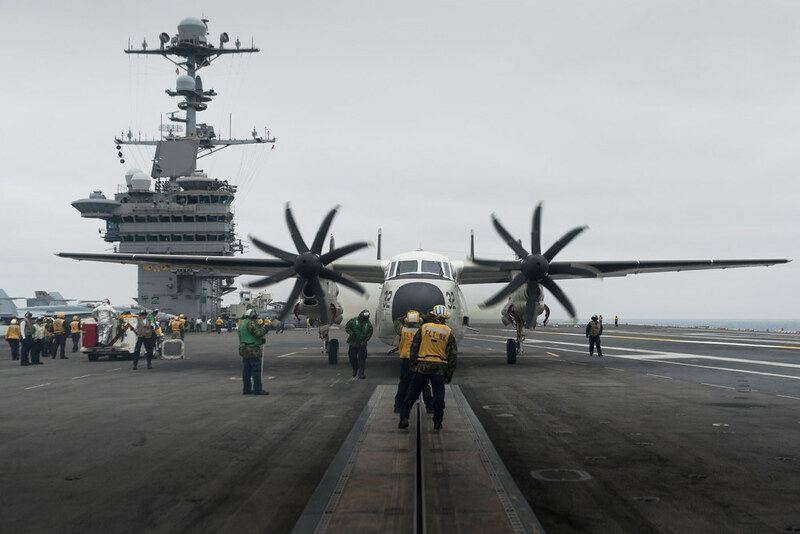 The air logistics hub was first operated in August when USS Anchorage (LPD 23) visited Trincomalee, Sri Lanka and supported the Essex Amphibious Ready Group as it transited the western boundary of the 7th Fleet area of operations. Building the necessary logistical footprint requires cooperation from all sides of the operation. “In addition to the deployed team, we have had excellent support from the fantastic professionals at the supporting agencies: Naval Supply Systems Command, Commander, Naval Air Forces, U.S. Embassy staff; this has truly been a global effort,” said Gage. “The Sri Lankan people have been incredibly hospitable hosts as we work on this shared endeavor." John C. Stennis Sailors play a major role in expanding the logistics hub concept. Moving forward, the team hopes to set a logistical standard for U.S. Navy vessels operating in the Indian Ocean. "The cumulative efforts of numerous stakeholders to facilitate the logistics hub in Sri Lanka will pay dividends for all future transiting units in addition to make our Navy more sustainable and a more formidable force throughout the Pacific theater," said Lt. Cmdr. Frederick Espy, a Commander Task Force (CTF) 70 maintenance, material, logistics, readiness representative.